First, let me say I am late for this month’s Lasang Pinoy. Sorry guys! Second, this post is extremely high in fat. Ok, now on with the show. This month’s theme, care of Ting-aling of World Class Cuiscene is “Let’s wash it down with booze!!”. It’s all about pulutan, which is our local slang for “food you take with booze”. Actually, the word pulot means to pick up, so pulutan would, I guess, translate to finger food. But it’s really much more than that. And it’s so much more than that complimentary bowl of stale nuts they give you at the bar. It encompases a wondrous food group that people gather around and enjoy when sharing a few (or more!) glasses of whatever poison they prefer. Now, there are tons of different pulutan here. Each province, each city, each barkada (that’s gang or posse or simply “group of friends” if you’re down with the linggo) has its own favorites. This is mine. Chicharon. 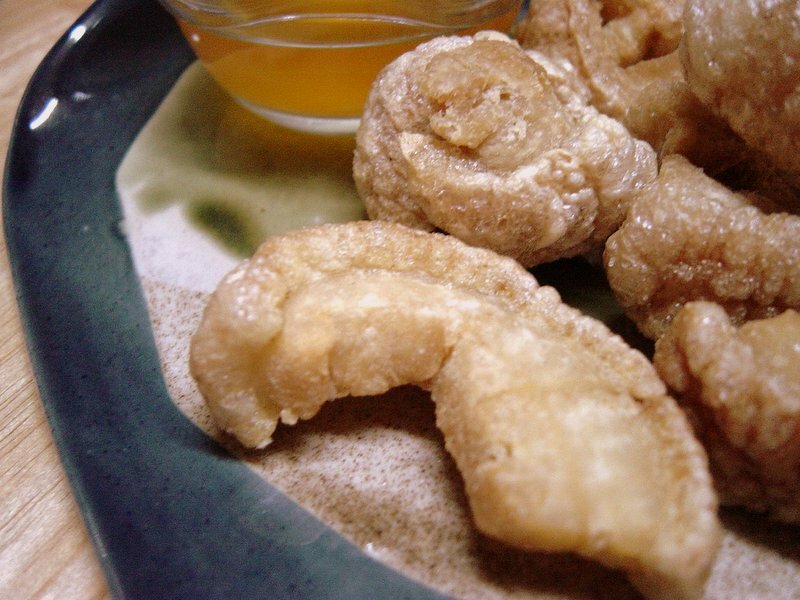 Pork crackling or pork rind in most other places, but chicharon to my dear cholesterol-loving heart. Pure, unadulterated, fatty perfection. What you see pictured above is the only way I’ll eat it…with the fat still on. Don’t give me chicharon that’s just skin. That’s like eating air! I need the fat baby! And my favorite pieces look just like that…the little crackling barely even being able to curl for the amount of fat its got. Yup, that’s fat you see there. Not slyly hidden fat that lurks in burgers and pizzas. This is the actual thing. Fat and nothing else. Fat with no additives if you will. Ok, maybe some salt (woohee!). Chicharon is like the bad boy you hid from your mother. No good but so good. Just the smell of chicharon makes my knees weak. When I take the first bite I lose my train of thought. It’s that bad. I mean good. I have eaten a good share of chicharon in my lifetime and it still happens: First bite, brain goes bzzzt. My favorite store (which sells only this) makes them fresh so you can feel the warmth through the sack. The anticipation is sometimes too much that I drive home with the sack pressed against my nose. Yes, an unholy addiction. Did you ever wonder why my name on this blog is ChichaJo? Well, now you know.